Taylor Schildroth (right) gets by Hall-Dale High School's Josh Nadeau during the Maine Class C Boys Basketball Championship game in this March 3, 2018, file photo. Taylor Schildroth didn’t plan on being back home in Blue Hill this weekend. He also did not expect to hear what he heard on social media the other night. 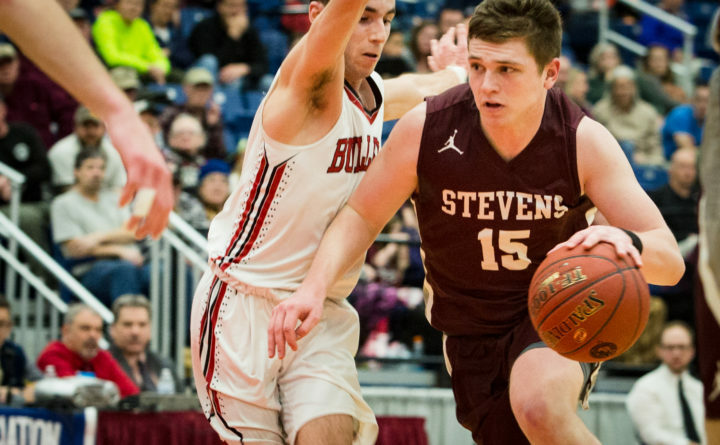 Schildroth, the former three-time Bangor Daily News All-Maine guard from George Stevens Academy, was spending this year as a reclassified senior at The Nation Christian Academy in Port St. Lucie, Florida. There, he was playing on the basketball team in hopes of continuing his athletic career in college next fall at the scholarship level. Those plans were sidetracked, at least temporarily, after Schildroth heard an audio clip of the Nation Christian Academy’s CEO — a Waterville native and longtime former club basketball coach in Maine — berating one of his teammates in a profanity-laced tirade that quickly went viral after becoming public Tuesday night. Schildroth decided to leave the school the next day. “I had heard about the argument before from living in the same house, but that was the first time I’d really heard the whole audio and listened to the whole thing,” Schildroth said. “That definitely caught me off guard. It was a heated argument, but he was saying some pretty terrible things. Nation Christian Academy CEO Mike “Woody” Woodbury was heard in the recording lashing out at Marvens Petion, a player who was planning to leave the program. He eventually transferred to West Oaks Academy in Orlando, Florida. The tirade has drawn outrage from throughout the basketball community nationwide on social media as well as from many of those who had played for him on the Maine AAU circuit before he relocated to Florida in recent years. Petion had moved to the United States from Haiti at age 15. According to a report published at sportingnews.com another member of the basketball team, Idrissa Bivens, also left the school because of the situation involving Woodbury. Woodbury, who remains at the school, sat down for an interview on Wednesday, his 43rd birthday, with Joe Santucci of Treasure Coast Newspapers. He said his “heart aches” about his interaction with Petion, who had lived with Woodbury for nearly a year. Woodbury said he feels awful that the incident exploits Petion. He was relatively unapologetic about his use of profanity during his meeting with the student. “I’m pretty vulgar. It doesn’t make it right,” he said. Schildroth initially wrote of his decision to leave Nation Christian Academy in a Twitter post Wednesday while waiting for a connecting flight between New York and Boston on his way back to Maine. “As many of you have probably seen, a video has surfaced with audio recording of a coach at the Nation Christian Academy. The things said on this video are terrible and completely against what I believe in. Because of this incident I have decided to return home to find a place better suited for my academic and athletic goals,” Schildroth wrote. Schildroth said while Woodbury was not officially listed as his coach at Nation Christian Academy, he essentially served in that capacity. “Technically he didn’t coach games, but he coached the practices, he ran all the recruiting stuff,” said Schildroth, who said he never played on one of Woodbury’s teams in Maine but did play against teams coached by him. Schildroth said the audio was an extreme example of how Woodbury conducted practices at The Nation Academy. “He liked to swear and yell in practices, but everyone has those coaches like that at some point in life,” Schildroth said. “Sometimes he would take it over the top but nothing like that recording. Warning: The following audio clip contains graphic language. Schildroth is a high-scoring guard who once scored 61 points in a game while at George Stevens Academy and led the Eagles to three consecutive Class C state championships before graduating last spring. He said much of his experience at Nation Christian Academy was serving its purposes for him in terms of self-improvement on the court and gaining recruiting exposure from NCAA Division I college basketball programs. Schildroth said he already has been contacted by several other prep schools about transferring for the rest of the academic year. Or he could enroll at a college or university next semester and attempt to walk on to that team. Schildroth expects to make that decision in the next couple of weeks. “Being down there I’ve already gotten a lot better, practicing with a lot of Division I guys,” he said. “I kind of rose to the top of the program after the first month and continued to prove what I’ve always thought, that I could play at the next level. According to a report on tcpalm.com, John Adams resigned in July as the principal at The Nation Christian Academy. He said he didn’t think Woodbury represented the Christian values on which the school had been founded.